(cut to length sleeving and tubing) is non-returnable. Very flexible!! Shrink ratio = 1.75 : 1. 600 volt. -70º to 121ºC operating temperature. 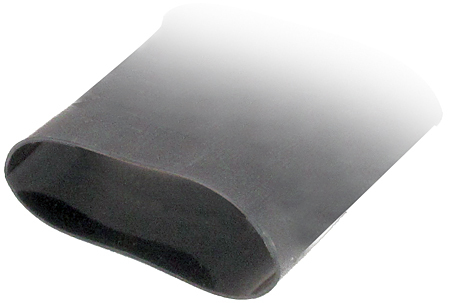 Tyco black neoprene heatshrink tubing. 1/2". Sold by the foot. Packed in 150 foot reels. Tyco black neoprene heatshrink tubing. 3/4". Sold by the foot. Packed in 100 foot reels. Tyco black neoprene heatshrink tubing. 5/8". Sold by the foot. Packed in 150 foot reels. Black heatshrink tubing. 1". Sold by the foot. Fits 16 gauge wire. White. 500 foot rolls. Great for many applications. Bentley Harris acrylic coated fiberglass sleeving. 2 gauge, 0.263" inside diameter. -25º to 155ºC. Sold by the foot or in 200 foot rolls. 9/16" outside diameter, 1/2" inner diameter. Internal ribs, plastic polyolefin, 62.5% shrinkage, self sealing, mildew / water resistant, 90ºC. 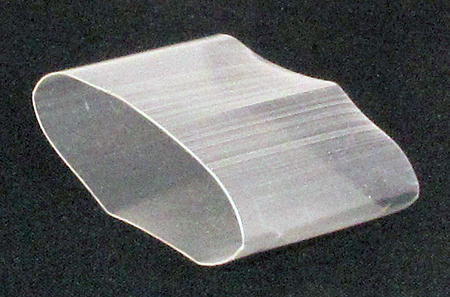 Clear / 1/2" Inner Diameter / Mil Spec. Available in 1 foot lengths only. Versafit heat shrink, white sleeving. 600v, 125ºC, EID=0.400", RID (shrunk)=0.176". Milspecs=M23053/5-107-9 — M23053/5-307-9. Manufactured by Raychem. P/N: 50587740, Versafit 3/8-9-SP. 200' rolls. 40,000 feet available!! 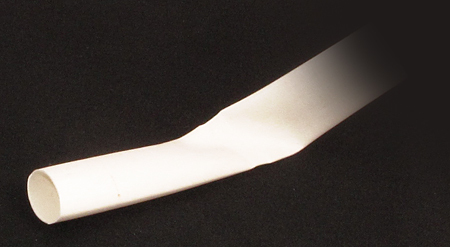 Versafit 3/4" white heat shrink tubing. 600v, 125ºC, VW-1, EID=0.805", RID (shrunk)=0.375". Milspecs=M23053/5-109-9. Manufactured by Raychem. P/N: 5058814006. 250' rolls. Raychem / Tyco heat shrink tubing. ATUM semi flexible, general purpose adhesive-lined, moisture proof heat-shrinkable tubing. Provides excellent environmental sealing, high strength bonding, operating temperature -55°C +110°C. Shrink ratio 3:1. 110ºC, 600v, RoHS, Shrink ratio = 4:1, EID: 0.354", RID: 0.118". 3/8" diameter. Black. Maximum continuous length is 4 ft., factory precut. Raychem / Tyco heat shrink tubing. ATUM semi flexible, general purpose adhesive-lined, moisture proof heat-shrinkable tubing. Provides excellent environmental sealing, high strength bonding, operating temperature -55°C +110°C. Shrink ratio 3:1. 1-1/2" diameter. Black, dual wall. M23053/4-305-0. NOTE: Sold in 4 foot lengths. Alpha FIT221 and FIT300 heat shrink tubing in 4 foot lengths. FIT221 is 2 to 1 @ 121ºC, 0.020 thickness. FIT300 is 3 to 1 shrink.